The cold, dark mournfullness of Portland, Oregon's AGALLOCH is rooted in the 1995 Death Metal band AEOLACHRYMAE. When this band collapsed three bands rose up- NOTHING, AGALLOCH and SUSURRUS IRANIS. 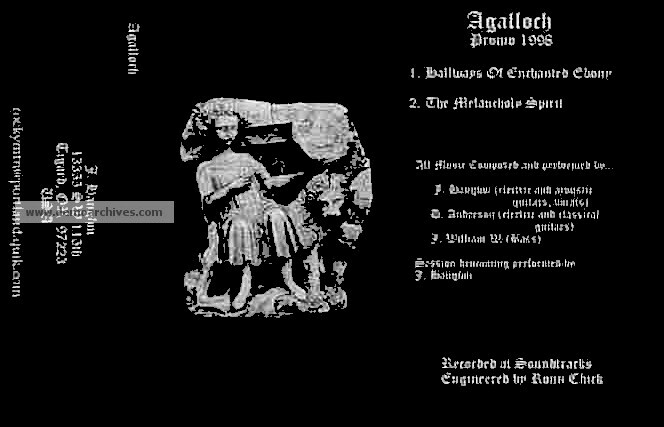 J. Haughn and S. Breyer created AGALLOCH, adding second guitar player L. Anderson during mid 1996. 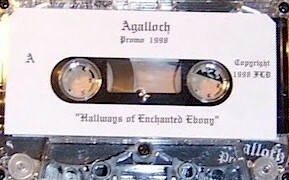 In this incarnation AGALLOCH weighed in with an inaugural demo session 'From Which Of This Oak' after which bassist J. William W. joined the band. A further promo tape scored the band with The End Records. The resulting album, 'Pale Folklore', was issued in June of 1997. Pro printed covers. Pro Tapes with stickers on the shell. Lyrics on the back. Around 200 were made. Xeroxed covers. Pro Tapes with stickers on the shell.